A thin man with a touch of gray leans against a wall in Boston’s South End and takes a long drag on his cigarette. He's pondering a question: Why are opioid overdose death rates steady or dropping for most drug users in Massachusetts, but rising among blacks? "I have no idea why it’s higher among blacks, none at all," says Gary. We've agreed to use just first names in this story for people whose drug history might hurt their chances of employment or housing. Gary exhales, then nods. "It’s the fentanyl, has to be the fentanyl," Gary says. The powerful synthetic opioid that has largely replaced heroin on the streets of Massachusetts was present in 85 percent of overdose deaths last year. That figure is included in a state quarterly report that shows that in 2017, overdose death rates dropped 13 percent for whites and 4 percent for Latinos, but increased 26 percent for blacks. The total death toll is higher for whites, and the greatest rate increase since 2014 is among Latinos, but the continued increase among blacks is disturbing, say public health officials. Researchers are diving into the data in Massachusetts and across the country for a better understanding of what's happening with black drug users. Data from the federal Centers for Disease Control and Prevention reveals a surge in opioid overdose deaths among blacks in many urban areas. For one man in Boston, the explanation is obvious. "There's an old saying, if it rains in the white community, there’s a tsunami in the black community," says George, a former inmate who helps others with re-entry. "That’s how things are, s--- rolls downhill, excuse the expression." In the fentanyl epidemic, says George, what blacks get at the bottom of the hill is the worst cut of the drug. "People who are more well-off will be closer to the distribution point so they would get it in its purer form," George says. "By the time it gets to these communities, it’s been tampered with many times. These are not chemists, so oftentimes these combinations end up being lethal." That may be especially true for blacks when fentanyl is mixed, intentionally or not, with cocaine. Death data in Massachusetts shows blacks have the highest rates of combined cocaine and fentanyl overdose deaths — and that rate increased 35 percent in the last three years. Some of these deaths are likely people who intend a speedball, taking cocaine as the stimulant and fentanyl as the depressant. But public health officials say many cocaine users may not realize their drugs are laced with fentanyl. "There's been fentanyl contamination of the cocaine supply," says Dr. Alex Walley, medical director of the opioid overdose prevention program at the Massachusetts Department of Public Health. "That means people who are using cocaine without the intention of using an opioid ... and are at much higher risk of an overdose because they are opioid-naive." Age is another risk factor for blacks. The CDC numbers show the greatest increases in black overdose deaths among 45- to 65-year-olds. Some of these men and women are longtime opioid users. 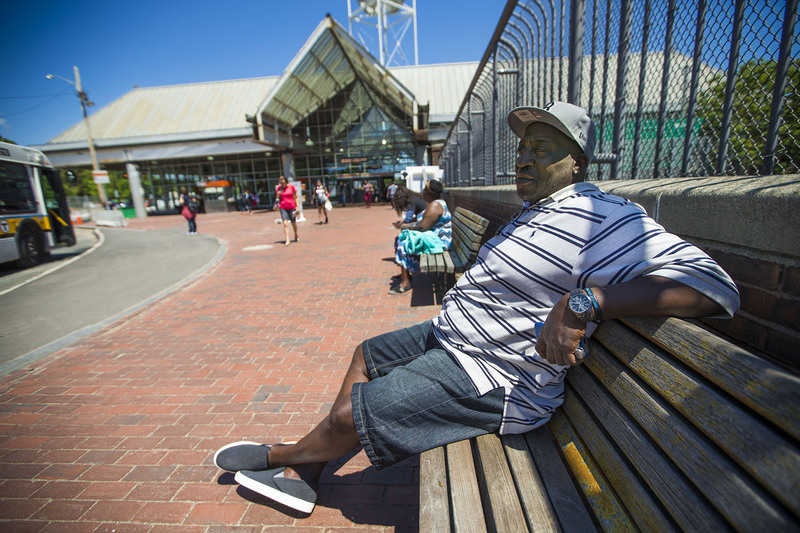 In Boston, Clarence, 53, says he's been addicted to heroin for 30 years, and the disease has taken a toll. "We’ve been beating our bodies up all our lives with this addiction," says Clarence, "it breaks our immune systems down." A weak immune system would make Clarence even more vulnerable to the increased potency of fentanyl. And there's another reason fentanyl may be overpowering older black drug users. Ricky Bluthenthal, a professor at the University of Southern California's Keck School of Medicine, says many of these users have settled on a small maintenance dose after years of injection, taking just enough heroin to avoid getting sick. "If the heroin people are used to doing [it] in small amounts, and you introduce a contaminant that's 50 times stronger, then that could lead to overdoses," says Bluthenthal, who has studied drug use risks and prevention since 1991. The deaths likely include relatively new drug users as well — a response to living with racism. "There is increasing use among blacks as they get older," says Dr. Ayana Jordan, an addiction psychiatrist at Yale University. "It may be linked to social determinants of health like discrimination, unemployment, poverty, unsafe housing — stresses that develop as you get older." Researchers point to many ways racism helps explain rising blacks opioid overdose death rates. Clarence tells another piece of the story: incarceration. Black men are six times more likely to spend time behind bars than are whites, often as a result of strict --and some argue discriminatory -- drug sentencing laws. Combine that risk with this one: In Massachusetts, the overdose death rate is 120 times higher for anyone recently released. "The crazy part about it is that we can be in jail for four or five years, get out of jail, and want to get high that day. We don’t even give ourselves a chance," Clarence says. Dr. Helena Hansen, an assistant professor of psychiatry at New York University, sees it a little differently: Men like Clarence don't have much of a chance. "They get released, craving opioids, isolated or disconnected from family members, dealing with a lot of triggers for opioid use," says Hansen, including a lack of stable housing or income and a criminal record that makes finding a job more difficult. "They buy what had been their prior dose of opioids before they got arrested and they overdose ... at even higher rates now likely due to fentanyl." If blacks do overdose, they aren’t likely to call 911, says Renee, a short woman with a wide smile. The issue, she says, is mistrust. "African-American people as a whole are not cop callers," she says. "911 is the same." Lili, a tall woman with bright red lipstick and blonde cornrows, says in her experience there’s no point calling for help from a predominantly black neighborhood. "I lived in Dorchester [where blacks are the largest racial group] and I moved to Norwood [a majority white town]. You call the cops, there in a second. Dorchester, you’re waiting about 45 [minutes], an hour for a cop to come, if they show up," Lili says. "It's kind of messed up. We feel like we’re alone out here. It makes you want to do drugs sometimes." There's concern that if blacks aren't seeking help from police, fire and EMTs, they will have less access to naloxone and fewer paths to treatment. In Connecticut, where the CDC says black opioid overdose deaths increased 135 percent from 2014 to 2016, the state Department of Mental Health is funding a 12-week recovery support program in four African-American churches that includes naloxone training and other sessions tied to the opioid epidemic. "We thought that one of the best partners would be the black church," says Yale's Jordan, who helped organize the program. "We're finding that if we are able to provide culturally relevant care in structures where people feel safe ... people will come out." Jordan says the sessions have been full so far. One of the goals is to connect users with providers who prescribe medication-assisted treatment (MAT). But first, Jordan and her colleagues have to persuade blacks that MAT is for them. There's a history of marketing buprenorphine, for example, as a treatment specifically for middle-class whites, according to NYU's Hansen. "The media and the resources for medication-assisted treatment [are] really advertised heavily in what I call the white-ification of the opioid crisis because it really is targeted to a specific user, which oftentimes is a white male," says Jordan. "There is a conscious exclusion of what treatment or help looks like that keeps black people from even thinking that this an illness they can get help for." Programs like the Connecticut churches partnership may be most useful in urban areas where black overdose deaths have risen most dramatically. Data provided to WBUR by the CDC shows Washington, D.C., at the top of that list, with a 213 percent increase between 2014 and 2016. Devin Larkin, who directs the Bureau of Recovery Services at the Boston Public Health Commission (BPHC), has expanded the commission's street outreach work into the largely black communities of Roxbury and Dorchester and increased bilingual services for Spanish-speaking clients. The BPHC has also started a home visit program that includes naloxone training and conversations with people who've recently overdosed. "There are people who are using alone, behind closed doors, and those are the people we really need to learn more about if we're going to reduce the mortality in Boston, because a majority of the deaths are happening when people are isolated and alone," Larkin says. 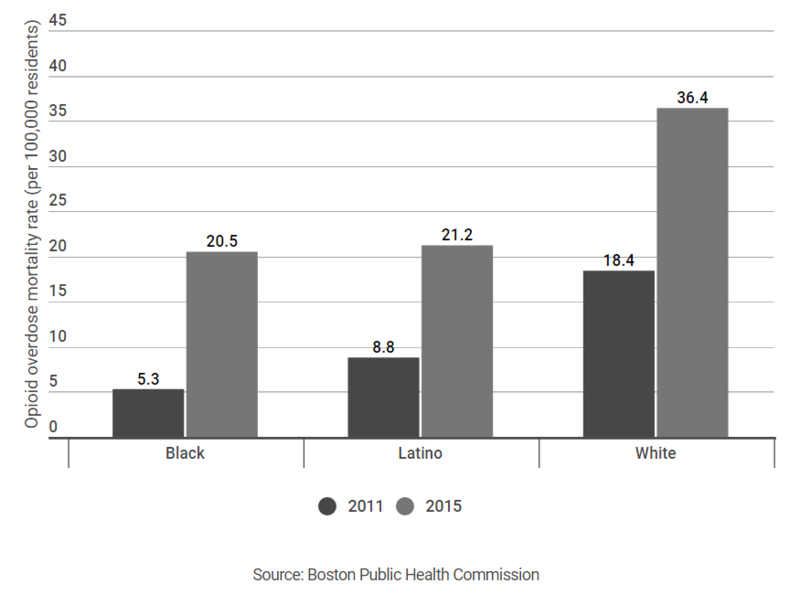 BPHC's numbers show that blacks are the least likely among Latinos and whites to show up at a hospital after an overdose. Massachusetts public health officials say they are looking into targeted interventions for blacks caught up in this opioid epidemic as well. "We thought this was mostly about white people for a long time," says DPH's Walley, who's also a physician and researcher at Boston Medical Center's Grayken Center. "Now we're seeing increases in 2016 with Hispanics and in 2017 with blacks. It re-balances our approach. Everyone is affected. 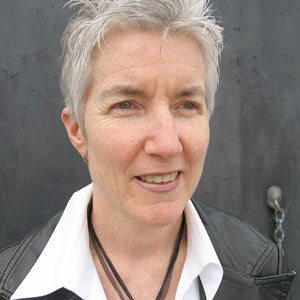 We need interventions that work for everyone." Some researchers say speculating on how the supply of fentanyl is hurting specific groups must not be the main focus. The problem, they say, is fentanyl. "I would step back and worry a little less about the race piece and worry more about the death piece," says USC's Bluthenthal. "Our response to both the opiate crisis, the heroin crisis and now fentanyl poisoning has just been inadequate. That's why people are dying. At its base, the problem is that we have not risen to the occasion." That, says Bluthenthal, is true for all races. This segment aired on May 24, 2018.